Home has always been considered the ideal place to experience your music. Now with the Amiron wireless, your music has the space to reach its full potential – and follow you wherever you go. Without cables. With best sound quality. Discover your favorite songs all over again with the pioneering beyerdynamic MIY App (“Make it yours”). At the heart of the MIY app are the award-winning sound personalization features developed by Mimi Hearing Technologies. A certified test allows you to analyze your own hearing. The Amiron wireless then adapts the sound precisely to your personal hearing profile – amazing you with an entire world of details that you never before knew could be heard. Whether desk, kitchen or armchair – your music can now follow your every move. Without cables. But with best sound quality. The Amiron wireless impresses with its ultimate ease of use via the intuitive touchpad and excellent Bluetooth® transmission. 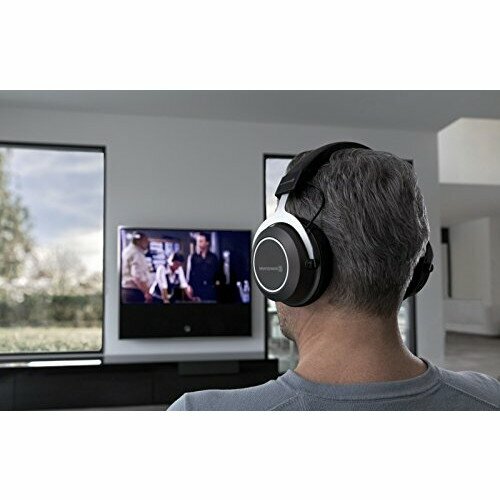 And fitted with the best available codecs: Qualcomm aptX HD and Apple AAC – plus aptX LL for audio transmission with least possible delay when watching TV and videos. Optimized for hi-res audio. The music that moves you deeply can finally move with you. Every room comes alive with the mind-blowing wealth of detail thanks to our legendary Tesla technology. No two seconds pass after the comfortable pads have enveloped your ears before you are immersed in the captivating spacious and realistic sounds produced by the Amiron wireless – from deep and precise basses to equally full and natural mids, through to silky-clear highs. The Amiron wireless will delight you for a very long time – and that's something you'll sense at the first touch. And the next. Year after year. This is the feeling of flawless workmanship carried out by experienced hands in our German headquarter – and of the unfading quality of our chosen materials, such as the soft headband made from Alcantara and the sophisticated aluminum details. Our sense of hearing is unique and changes over the course of our lives. Like a mosaic, some pieces of the sound picture get lost or they fade. The unique MOSAYC sound personalization by Mimi Defined compensates exactly this development and adjusts itself precisely to your hearing ability. With individual sound personalization, the missing tiles of the mosaic are restored. And you can enjoy the full sound picture in all its colourful splendour. And it's really easy: Download MIY app for Android or iOS, apply the sound profile by Mimi Defined and experience a splendid sound picture – in all its glorious detail.